GM is preparing to do a 100-1 reverse split after issuing up to 60 billion new shares to pay down debt. Please consider GM details plans to wipe out current shareholders. General Motors Corp on Tuesday detailed plans to all but wipe out the holdings of remaining shareholders by issuing up to 60 billion new shares in a bid to pay off debt to the U.S. government, bondholders and the United Auto Workers union. The flood of new stock issuance that could be unleashed has been widely expected by analysts who have long warned that GM's shares could be worthless whether the company restructures out of court or in bankruptcy. The debt-for-equity exchanges detailed in the filing with the Securities and Exchange Commission would leave GM's stock investors with just 1 percent of the equity in a restructured automaker, ending a long run when the Dow component was seen as a bellwether for the strength of the broader U.S. economy. GM shares closed on Tuesday at $1.85 on the New York Stock Exchange. The stock would be worth just over 1 cent if the first phase of GM's restructuring moves forward as described. General Motors Corp. notified shareholders Tuesday it is planning a reverse stock split that would give them one share of new stock for every 100 shares they currently own. The automaker said in a filing with the Securities and Exchange Commission that the deal would be part of an agreement with the Treasury Department in which the government would assume at least half of GM's debt in exchange for company shares. GM will send the information to shareholders currently holding a total of 610.5 million outstanding shares. 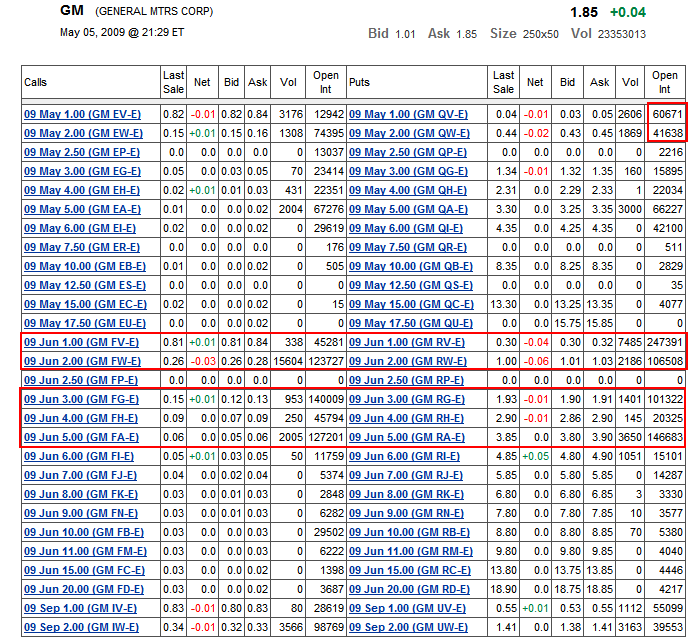 When all the deals are done GM expects to have about 62 billion shares, 100 times more than currently are outstanding. "If the restructuring as currently contemplated occurs, there will be very substantial dilution to existing holders of GM common stock," GM's filing said. Hence, the reverse stock split proposal. Critics, mainly bondholders, have accused the Obama administration of favoring the government and the UAW at the expense of investors. Inquiring minds are investigating how option traders perceive the action. Please consider GM option plays. 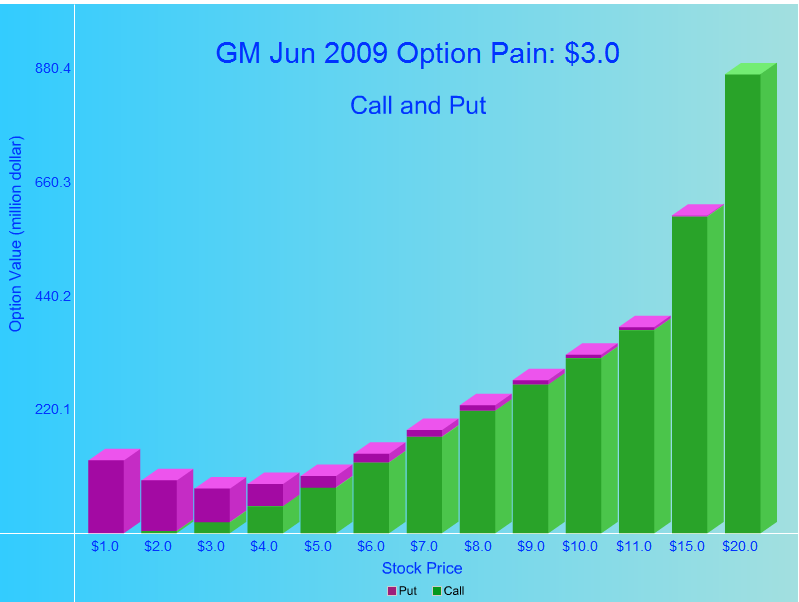 If GM's demise comes on or before May 15, then holders of 60,671 PUTs will see the value soar from 3 cents to 99 cents equating to a gain of 3000+%. I am not recommending this play, but I sure as hell would not want to be the writer of those options. More likely is a demise by June 19 which would see the bid on June puts rising from 30 cents to 99 cents or so (assuming the scenario plays out as described above). Without recommending (or playing) the over/under line, I would bet on the under line, presuming GM is highly unlikely to close over $3 at the June expiry. However, strike 3 PUT holders paying $1.90 for the option need to see a close below $1.10 at the June expiry (assuming options held for duration), to show a profit.